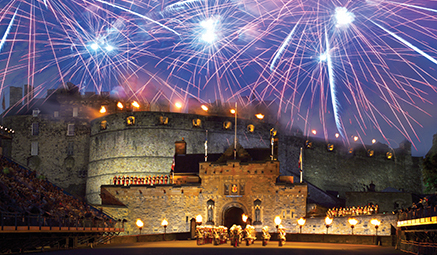 Edinburgh buzzes with excitement as music, heritage and culture take centre stage at The Royal Military Tattoo, the highlight of the Edinburgh Festival. 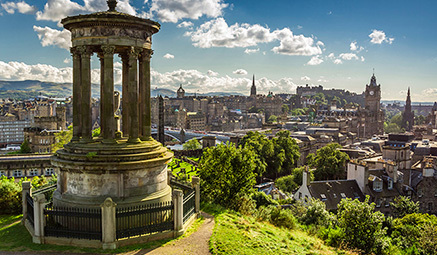 Edinburgh’s cobbled streets come alive with street performers, pavement artists and live music hits you at every corner. After time to soak up the atmosphere, enjoy an unforgettable night of ceremony, theatre, dance and massed pipes from home grown artists, as well as international, all finished off with a magnificent fireworks display (weather permitting) held high above the iconic castle. 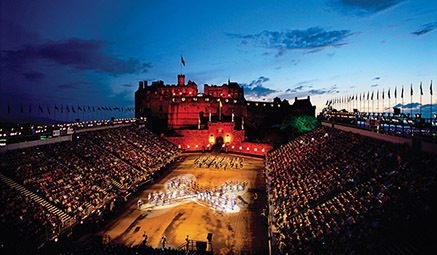 The Royal Edinburgh Military Tattoo - Full Day - a spectacle of music, dance and spine-tingling displays, all set against the stunning backdrop of Edinburgh Castle. After an early lunch we leave the hotel and head for Edinburgh, the beautiful Scottish capital full of historic buildings, bustling streets and busy shops. After seeing the sights it's time to enjoy an unforgettable evening at the Tattoo. Following a night of jaw-dropping spectacles and fun all round, we’ll return to the hotel around midnight. - Special Note: from the coach set down point there is a short but steep cobbled incline to the castle area. Thereafter there are steps to climb to the seating area.